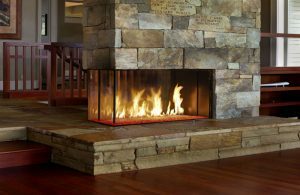 The Magnum Series Fireplace System has the largest opening available in the market with true finished openings of 28″, 36″, 41″ and 45″ width with a 36″ height. These larger openings are ideal for more dramatic indoor and outdoor applications. With the proprietary straight-back interior design and innovative contoured shelf, the modular Magnum Series is second to none in efficiency, performance and custom fireplace design flexibility. The Magnum Series Fireplaces (Model Sizes 28 – 48) are also available for Combustible Floor Installation using our Fire-Lite Application. See Installation Manual for more details.